You’ve signed on the dotted line, but you still have a lot of work ahead of you. Here’s how to make the process easy both before and after your move. Mark your calendar with a timeline for events leading up to, on and after moving day. Be generous with time allotments and leave room for extra trips back and forth. Put everything you can think of into the schedule, and keep this in your binder with other important moving checklists, labels and documents. "Creating a schedule before you move of the things that you want to get done before your belongings arrive is a good idea. So thinking about those details ahead of time and accomplishing them before moving day can help reduce the stress of the move." It's also helpful to create a timeline of what you need to unpack first. Adams explains that "I always think it's a good idea to get the bedroom and bedding in place immediately, so that you can sleep comfortably in your new home, then focus on the kitchen." Having a large project like the kitchen checked off of your list, and a space to relax in gives you a great starting point to unpacking and settling in to the rest of the house. You'll sleep sounder at night knowing that only you have the keys to the house. Adams explains that it's "prudent to change the locks before your belongings are in the house." But if you didn't have the chance to do this earlier, immediately add this to your list of things to do after moving in. Swap out any exterior locks and change your set of house keys to ensure only you have access. While arranging for service to be transferred or turned on was a to-do item before your move-in date, double check that everything works as it should. This list should include water, gas and electricity in addition to cable and internet providers so the rest of your checklist of what to do after moving goes smoothly. This takes about three minutes to complete and is well worth the effort. Switching out the filters improves the performance of the home’s air conditioner and cuts down on allergens. Pro Tip: Save the date! Write down when air filters were changed to keep an eye on when they should be replaced. In a home without pets, that's every 90 days, or 30-45 if you do have a pet. While an occasional spider can be a welcome guest, mice, rats, termites and roaches are not. If some pest evidence was noted in your home inspection, now’s the time to call in an exterminator. Even if nothing was noted, scheduling your own inspection shortly after moving in is a good investment for heading off potentially damaging infestations. While you have wiped down countertops and cleaned out the kitchen cabinets, it’s important to do a deep clean of your new home. Steam clean carpets, wash windows and walls, dust air vents and mop the floors. The dirt and dust from movers trekking through rooms and opening up cardboard boxes can pile up quickly! Even if you’re Mr. Clean himself, you’ll want to remove toilet seats to clean around seat hinges. Often, it’s best to replace the entire seat once you’ve moved in. With new models featuring night-lights and lids that automatically shut, it’s a small investment that makes a big difference in the bathroom. Don’t kick back and relax just yet. Once you’ve officially unpacked, make your home feel like yours. Whether it’s a small change like purchasing a new welcome mat, or something a little more time-consuming such as painting the front door or an accent wall, adding a touch of your personality can make all the difference. Now it’s time to kick back, relax and enjoy spending time in your new home. If that’s not up your alley and you’re itching to take on some DIY work, here are a few projects you should start with. Did we miss something on our list? Let us know what you did after moving to your new home in the comments below! If you're looking for expert moving advice, check out our Ultimate Moving Guide with week-by-week checklist and packing labels to get you ready for the big day. 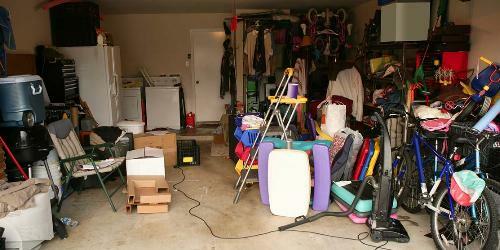 From deciding what to keep and what to toss to learning the best ways to remove oil stains from the floor, learn how to clean out your garage before you get it organized. If your mudroom puts the emphasis on “mud” rather than “room,” it’s time to carve out some time to clean and organize.